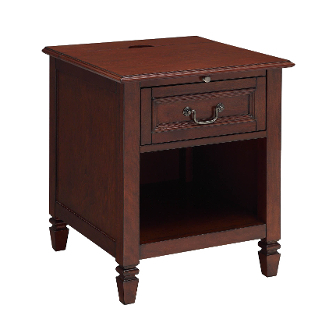 The Carlton Nightstand with Charging Station is a combination of traditional style and modern convenience. This nightstand is elegant and simple in design. It features a hidden compartment on the table top for charging electronics and keeping unsightly cords out of the way. Also, it features a drawer for additional storage and a bottom shelf for storing books or other accessories. The finish brings warmth and elegance into any space. The charging station contains a power outlet and 2 USB ports. Dimensions: 24"W X 20"D X 22"H. Assembly is required.